Click above to send a follow request - I almost always accept. The fiftieth anniversary special of Doctor Who is just around the corner, and what with trailers, interviews, leaked photos from set and gossip from the cast, there's a fairly huge amount of info about it doing the rounds. -Matt's regeneration (or the circumstances surrounding it, anyway) has more than little in common with that of the First Doctor. -Silence MUST AND WILL fall when the question is asked. -Expect enemies galore! But not all of them are real. 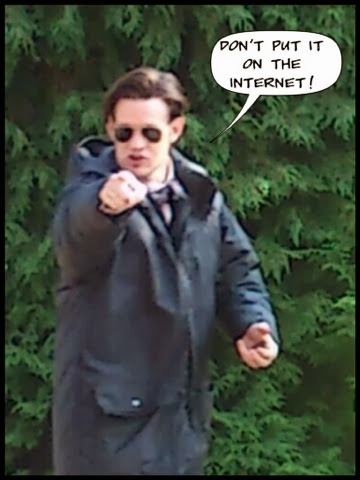 -Matt really is the 'Kids' Doctor' - there are drawings to prove it! -An intimate area of a previous companion (sort of, anyway "LOL!") makes an important reappearance. -Moffat is most definitely making his first Doctor the longest-serving incarnation! -The "Tenth" Doctor was so, so vain. To "Eleven"'s detriment, it would seem! -But where on Earth can it all go from there?! Trailers, interviews and images from the fiftieth are available all over the bloody place. Google! After a day of searching the Internet and the streets of Cardiff for Doctor Who filming - and after FOUR (yes, four) false alarms - we have admitted defeat: we don't know where they are today. Words by Gareth Bundy, 2013. Photos/videos © their respective owners. No infringement intended. Simple theme. Powered by Blogger.